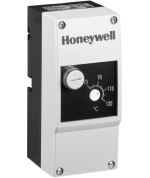 The STB Servies of universal strap-on thermostats are designed for floor heating applications. They are suitable for use as strap-on, wall-mounted, or (with optional immersion well) immersion thermostat. Devices of the STB Series likewise measure temperature. If the sensor temperature exceeds the set value, a snap-action switch opens, interrupting the electrical circuit, and remains open until reset manually. (Also, if the sensor temperatuire drops to below approx. - 20 degrees C, the snap-action switch opens, but closes again automatically after the temperature rises again.) To manually reset the device, the sensor temperature must drop by more than approx. 10 K.